A tricky level with 4 rows of star stones! The two top rows (blue and green) are particularly tough to crack as they require triggering twice to remove. 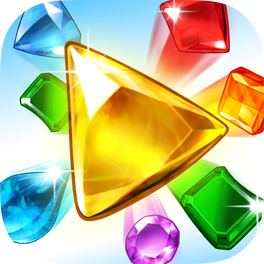 However, the permanent placement of the star stones makes it pretty easy to get free spins. Focus on getting free spins and you will soon start removing all the stones. Take your time and review the board for potential star stone matches after every move. Remove star stones by making a chain of the same color that touches each stone. At the start of each spin take your time to see if there are any potential star stone matches. If there are multiples available, make sure you work from the top down! Shifters are extremely useful on this level - if you have them make use of them! Especially if you are close to finishing the level. If you get the opportunity after failing the level, watch a video to earn a free continue token. It may be enough to get you to success!